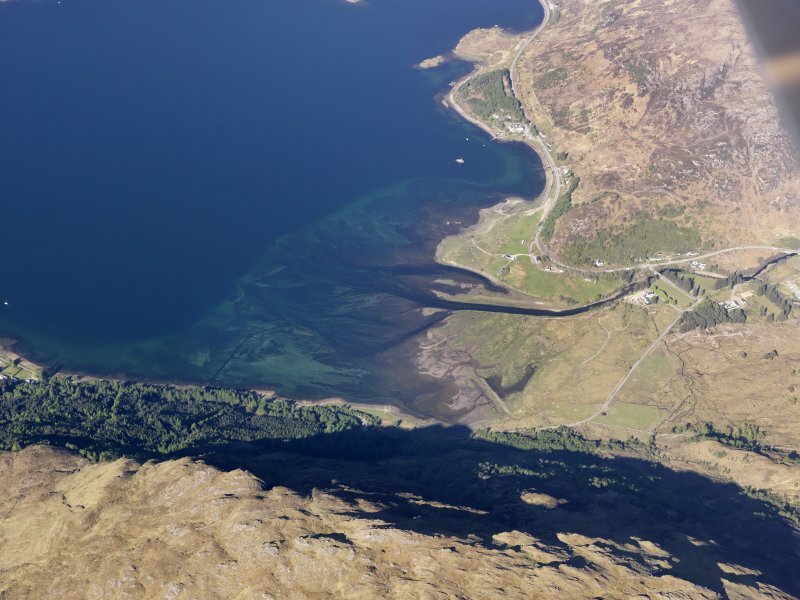 General oblique aerial view of the remains of a fish trap near Shiel Bridge at the head of Loch Duich, taken from the SSW. 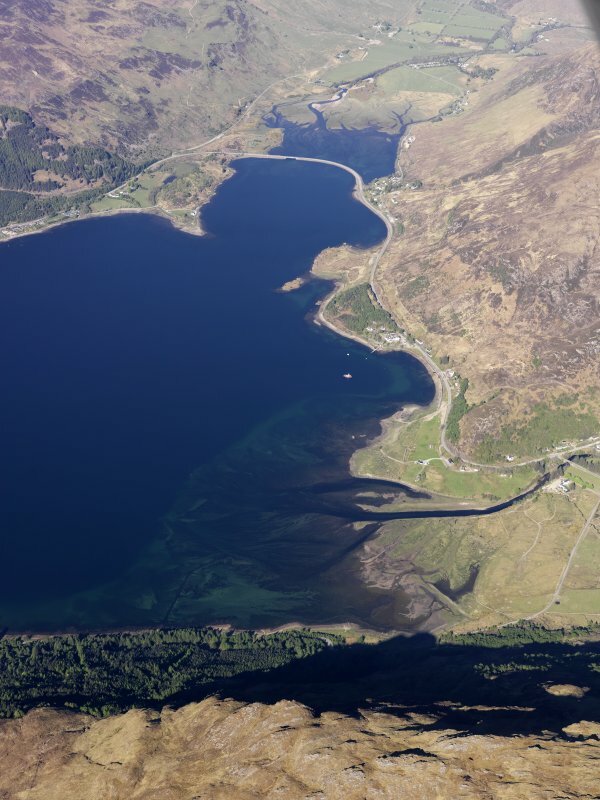 Oblique aerial view of the remains of a fish trap near Shiel Bridge at the head of Loch Duich, taken from the SE. 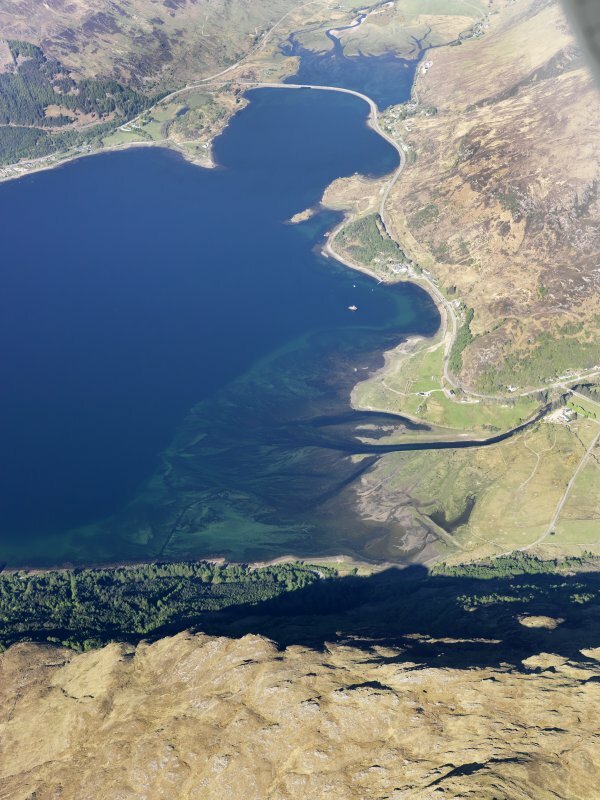 General oblique aerial view of the remains of a fish trap near Shiel Bridge at the head of Loch Duich, taken from the SW.
"Cill Fearchair" - Farquhar's Cell or Church - is applied to a disused burial ground. The dedication may be to a saint who does not appear in the Calendars. W J Watson 1904 and 1926. 5' 9" high and 1' thick. This burial ground appears to have consisted of two small co-joined circular enclosures. The northern one, c. 13.5m in diameter is enclosed by a turf-covered wall 1.5m wide by 0.4m max height. The other, abutting on to the S side of the first, is only vaguely visible, its S edge being destroyed by road works. The standing stone lies within this enclosure. No trace of any other internal feature was seen in either enclosure. The stone is within 10.0m of the new roadworks and appears to be in a very vulnerable position. Visited by OS (W D J) 26 September 1966. Cill Fhearchair - Fraquhar's cell or church - is the name given to a disused burial ground. The dedication may be to a saint but he does not appear in the Calendars. Within the 'burial ground' is a standing stone, undressed, c1.75m high by 0.3m thick. The 'burial ground' appears to have consisted of two conjoined circular enclosures. That to the N is c13.5m in diameter with turf-covered walls c1.5m wide surviving up to 0.4m high. That to the S is only just visible as it has been partially destroyed during road-widening works. The standing stone is in this S enclosure, perilously close to the modern road. A 'modern' NTS sign has been inserted into the slight turf dyke of the S enclosure by the road. There are fragmentary remains of walling to N of this complex. The surviving remains are not obviously recognisable as the site of a former burial ground and are only assumed to be so on the strength of local tradition. The recorded medieval church and burial ground were at Kildowich - St Dubhthach's - on the Nside of the mouth of the river Croe. The 1st and 2nd ed OS maps record that the standing stone was surrounded by a single circular enclosure. The relationship between the S and N circular enclosures is unclear, bearing in mind the details given on the 1st ed OS map.